Just saw this bully case between OUG's Steven Corner with another shop owner on Facebook. From what the newspaper reported, it stated that the boss of Steven Corner hit the uncle because he was trying to remove the tables which were placed in front of his shop. Steven corner already put the table in front of this shop before it close and this cause the difficulty of transferring stock into his shop that will arrive soon. It was said that part of the cause of this incident is because the owner of the shop refused to transfer his shop to somebody else. But it shouldn't leads to people being ambushed because they are trying to do their business too. Below are more detail story about the fight and hidden fact that most people won't able to know. 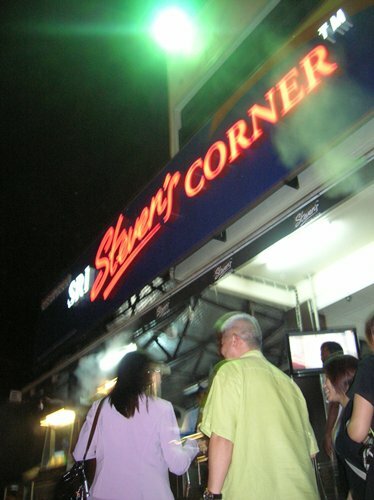 "OUG Steven's Corner next door in our cargo. Every evening, there will more than three tables and chairs placed in front of our shop. Before that we have told them that we are not closing yet, it will hinder our goods up and down.. But every day they are still doing the same.. Sometimes we have to remove those tables and chairs AFTER we had "consult" them too! At about eight o'clock, my home, as usual the public getting goods to the cargo hold. Similarly, the cargo door in his office chair, but sitting people. So those who called for the public house to another table, and remove the furniture before he could be getting goods. But the sad truth this time, Steven's Corner of the big boss came home directly ... questioning why he was removing the public and those tables and chairs. Without enough time to respond, hitting and punching has come up! Workers at the scene who saw this situation quickly inform his family member. When his family member arrived at the scene, they sawhe is already fell to the ground. How can a more than 60 years old guy know how to hold up? There are wicked brothers from Steven Corner's came to see them also brandished a knife and hacked them to say it! Steven's Corner large group of employees hold their boss and only avoid engaging in any death! There was even a Chinese arrived, said: "This field I see, what you doing here?" Ha ha! Do you believe it? mamak shop there have people who will "watch" ah! The big boss villain also threatened us that if we call the police, they would not be afraid, but we have to be careful out does not rule out the possibility set fire to shops! This has also become part of the world? This road has become Jalan Steven's Corner! Soon, the police and Qin YB Teresa Kok came to understand the situation. YB understand why things happen, the public was sent to Ma house the hospital's injury, beat people who were sent to police custody. YB account of her hands to help go after the meeting. The scene may have to report from the police heard that in so. . Otherwise, far away. . Without the presence of YB, I believe that the wicked will not be sent to the police station! Steven's Corner store has installed CCTV, as long as the police open view, will be able to see the whole process of the crime, just to see if they want to do it! On the other hand, the public is probably home to more than nine major hospitals in Malaysia, but frustrating to have to complete the whole experience an hour before injury! Have to "admire" the efficiency of our hospitals! Complete examination after injury, arrived at the police station reported. 1 into the police station, saw the guy there waiting. At that time, I am really happy because I really think that the wicked are detained.. We also found that the guy is quite familiar with the police too! They can sit in the garden chairs talking incessantly. .
Masters of public statements in the record, we look everywhere. . Hurry up! We found that the police Pianting wicked! Not to say that being "Lokap" it? Why he can sitting there? That Pianting air-conditioning, TV, sofa. . He is also free to call it! What is with this world? After the statement was recorded, the police told me to go home Pianting public. . Also to why the matter. 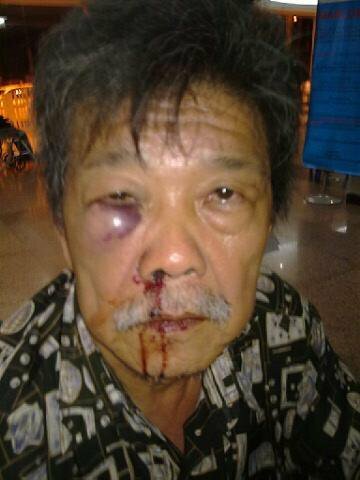 Originally, we just call the police entirely beaten my old age homes and the wicked public reconciliation! God! It really is money on the big finish? There is no justice yet? Who also was beaten as nothing happened? My family did not consider the public came out directly. . This morning, YB Teresa Kok Qin organized a press conference, I hope the authorities will take this matter seriously, but also want to give us a fair, but hope this can stop the evil villain to go! He is not only the education director of the South China small ceramic shop owner, is the leader in many social groups! " You can comment about it. Do subscribe to TianChad @ 永遇乐 or follow @TianChad on Twitter for future blog post update =) Do share on Facebook/Twitter if you like it~! i was curious as to what happened.. that's quite shocking.. sigh. Malaysia policemen are a disgrace la..
Never stop trying to speak up. Cos in the end more people will gather up and united and makes the voice louder. For example the Anti Merdeka Tower on Facebook. Can see lots of people don't want it to be build.